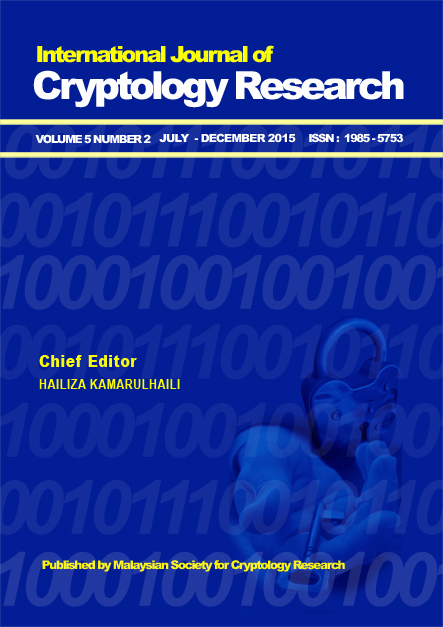 The International Journal of Cryptology Research is the official journal of the Malaysian Society for Cryptology Research, and provides a forum for publication of original results in all areas of modern information security. It consists of two issues per year. The journal publishes original research papers and review articles on and related modern information security, covering topics in the areas of but not limited to theoretical foundations, applications, implementations and any related issues in cryptology, information and network security and other underlying technologies. The subscription price is US$50.00 per volume plus US$15.00 for handling and postage. The Malaysian Society for Cryptology Research (MSCR) is a non-profit organization consisting of academics, researchers, specialists, students and institutions interested to further research in cryptology and related fields. ©MSCR 2019. All right reserved.